What do you dream about? For some, it might be winning the lottery. For others, it might be increasing their yarn stash. And for some of us, it might be another set of knitting needles such as the Knitter’s Pride Dreamz Interchangeable Needle Set. The rainbow of colors, great sizes, wooden tips, and screw-in cables of the Dreamz Interchangeable Needles keep many knitters dreaming of their next project. Taking wooden needles a step further, Knitter’s Pride uses densified birch wood to create a stronger knitting needle for their Dreamz interchangeable needles. If you like wooden knitting needles, but seem to easily break them, you might find that these needles make your project dreams come true. 4 Cords to make needle lengths: 24", 2 x 32", and 40"
Knitter’s Pride has a long-standing reputation as a knitting needle manufacturer. Known outside of the US under the brand name, Knit Pro, these needles are easy to find around the world. Denser than plain wood or bamboo, but lightweight and strong, Knitter’s Pride Dreamz Interchangeable needles give wooden knitting needle fans a reason to cast on another ball of yarn. These are general all-purpose needles which work well for most yarn weights. Some knitters may find it a little challenging to work with dark colored yarn as the the Dreamz needle tips and cables are dark colored. A reading lamp can help make things easier. These interchangeable needles are good for beginners as the stitches slide easily, but not too quickly. There is just enough grab to help minimize dropped stitches. But lace knitters may find these stitches difficult to use as the rounded tips can make complicated increases and decreases challenging to knit, especially with lighter yarn weights. The brightly colored needles make knitting fun, and finding the right sized pair of needles a breeze. How Well Will These Interchangeable Circular Knitting Needles Work for You? Needle tips. Made from densified birch wood (wood treated with resin, heated at a high temperature and pressurized), Dreamz interchangeable needle tips have as much strength as metal but a fraction of the weight. The connector end of the needle tip, made from metal, shines brightly against the colorful wooden tips. Cables. Screw-in plastic cables make it easy to connect the cables to the tips. The Dreamz interchange cables work will for magic loop or for small items such as hats. The cables can kink and curl, which can be distracting. The colors of the needle tips and cables can make it hard to see stitches when knitting with either dark yarn or yarn that is a similar color to the tips and cables. Needle. With a generous 5 inch length, the needle tip works great for knitters that like more needle and less cord to hold. Knitters with large hands or those whose hands fatigue easily may also benefit from the 5 inch needle length. Cord or cable. The Dreamz Interchangeable needles set includes 4 cables at lengths of 24 in, 2 x 32 in, and 40 in. Connectors to make longer cables must be purchased separately. You can use the pre-drilled pin hole (for extra leverage when tightening) on the needle connection end to insert a lifeline whenever you need one. Not too sharp and not too rounded, the tips makes this interchangeable needle set great for almost any yarn weight. The medium length taper gives you plenty of room to work into the next stitch. It’s a good general use needle, but lace knitters and anyone who knits tightly may find that the tip isn’t sharp enough to get into stitches, especially when increasing and decreasing. If you’ve used interchangeable needles before, you might have found that you inadvertently match the wrong sized needle tips for your project. What a pain to have to start your project over again or spend time finding your needle gauge! With the Dreamz interchangeable needles, Knitter’s Pride made this problem disappear by color-coding the needles so you always know that your needles match. Sized US 4 – 11, the Knitter’s Pride Dreamz interchangeable needle set includes 9 different sized pairs of needles that work well for most DK to bulky yarn weights. Sizes printed on the needles may wear off over time, but the numbers also come etched on the metal end. In addition, each needle size is a different color so having the printed size wear away may not be an issue for most knitters. You can organize your needles by size or by color. Not only do the colors of the needles look gorgeous, the color names sound just as good – Aquamarine, Orange Lily, Fuchsia Fan, Grey Onyx, Cherry Blossom, Misty Green, Candy Pink, Purple Passion, Royale Blue. Added bonus in the Dreamz set of interchangeable needles: Size markers! What a nifty idea! When you can’t wait to get started on another project and need needles already in use, simply remove the needles and slide on a marker coded with the needle size onto the cable, then screw on an end cap. No more remembering what size needle you used because the size marker remembers for you. Like most interchangeable needles, the Knitter’s Pride Dreamz uses a screw-in join. This type of join is more likely to come apart than other joins. Whenever you pick up your knitting, we recommend tightening the join to help make sure the tips and cable don’t come apart while you knit. Accessories include a pin to use as leverage to make a tighter join or for getting just the right torque to help in unscrewing the needle and cable. The tight join and smooth taper between the tips and cable keep yarns from snagging. With the basic needle sizes in the Dreamz set, knitters find that most yarns from a DK (yarn weight 3 Light) up to a Bulky (yarn weight 5) work well. Lace, Super Fine, and some Fine yarn weights may not work as well due to the size of the needles that come with the set, as well as the rounded tips which can make it more difficult to work stitches with smaller yarn weights. The rounded tips should work well with cottons or other yarns that tend to split as the tips slide under these plied yarns rather than through them. Stronger than wood or bamboo, densified birch wood makes a strong but lightweight interchangeable knitting needle. Less likely to dent with use than other woods, these needles should last for years without snagging yarns. The two parts of the needles – wood needle and metal connection – could always separate, but this is typical of any knitting needle made from multiple materials. The flexible cable works well for magic loop; however, too much bending or bending at sharp angles can kink the plastic cable. Again, a typical occurrence for any circular or interchangeable needle with a plastic cord. 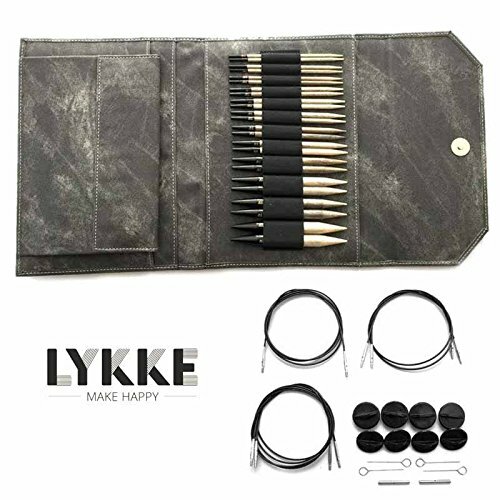 This needle set comes with a case for organizing and storing the tips and cables, but we found the case to be less durable than other brands. 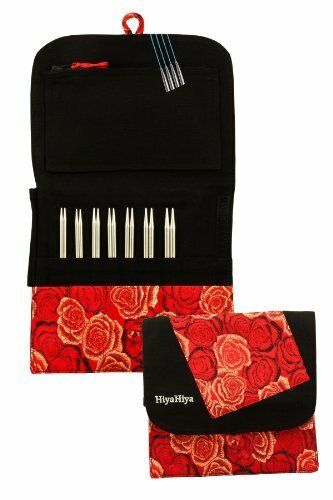 One of the benefits of an interchangeable needle set is the ability to take your needles everywhere with ease, and to keep everything nicely stored and organized – not just to find things more easily, but to keep the tips and cables from harm. In our opinion, this case does not meet our needs and would need to be replaced for long-term use. The hardness of the densified birch allows most yarns to slide as if on a metal needle, but it also gives the Knitter’s Pride Dreamz Interchangeable Needles a bit of stickiness, just like bamboo or regular wood needles. These needles could be a good choice for first time knitters to get the feel of speed without the risk of losing stitches. Although not as forgiving as bamboo or regular wooden needles, these interchangeable circular needles do warm-up while in use, making them a good choice for knitters who experience soreness in their hands while knitting. Some knitters may find that the darker colored needles and cords can make it hard to see stitches when using dark yarn. Built for speed, you can knit much faster with the polished brass of these addi Click needles. Cables click-in to needles helping them stay connected while knitting. Swivel cable keeps the screw-in connection tighter as stitches pass over the join. The sharper points on these stainless steel needles work great for smaller yarn weights. Knitters looking for a lightweight needle may find these aluminum needles to be lighter than wooden ones. Knitters appreciate the rounder points on these tips when working with cotton yarns. Kink free cables give these needles aa leg-up on the competition. The stainless steel needles allow stitches to slide easily, but gives a bit of grip, just like wood. Similar in many aspects to the Knitter's Pride Dreamz Interchangeable Needles, except the Lykke wood won’t hold up as well as the Dreamz' densified wood.